Back to WHO WAS ALEXANDER PUSHKIN? ﻿﻿"U Lukomorya" (by the bay) - the Prologue to "Ruslan and Ludmila"
Pushkin started writing as a child and continued all his life. He wrote poems, stories and folk tales. The folk tales were said to be inspired by the stories he had heard from his old nanny. You can read another English translation of the poem below. Goes to the left, begins a tale. All Rus's magic lies in wait! I'll tell it to society. Translated into English by Peter France. ed. Robert Chandler, Boris Dralyuk, Irina Mashinski. Penguin Classics, 2015, ISBN 9780141198309. The leshy is a woodland spirit. Can you find a house on chicken's legs, the ocean's lord, a wizard, Baba-Yaga and her mortar, and Kashchey in Russian folk tales? Rus, as you might have guessed, is an old word for Russia. You will find out more in History. lived an old man and his old woman. in a tumbledown hut made of mud. the old woman span with her spinning wheel. and all he caught in his net was slime. and all he caught in his net was weed. no ordinary fish, but a golden fish. and not once had he heard a fish talk. 'God be with you, golden fish! I don't need your grand ransom. Off you go — into the deep blue sea! she begged to go home, into the blue sea. she said she would grant whatever I wished. But I didn't dare take this ransom. 'Simple fool, fool of a simpleton! What stopped you taking this ransom? A mere fish — and you were too frightened! You could at least have got a new washtub. Off he went towards the blue sea. 'Have mercy on me, Sovereign Fish. My old woman is cursing and scolding me. Though I am old, she gives me no peace. She needs a new washtub, she says. 'Take heart — and God be with you! The old man went back to his old woman. all you got from the fish was a washtub. What wealth can be found in a washtub? Get on back, you fool, to the fish. My old woman is cursing and raging. but not a trace of his hut could he find. and two strong gates hewn from oak. all you got from the fish was a house. I don't want to be a lowly peasant. cursing me for all she is worth. She doesn't want to be a lowly peasant. and saw? He saw a tall mansion. His old woman was standing there in the porch. a precious waistcoat trimmed with sable. and gold rings encircled her fingers. she was slapping them and pulling their hair. 'Good day, Lady Countess Baroness! and packed him off to work in the stables. A week passed, and another week. The old woman grew madder than ever. 'What's got into you, woman? Are you crazy? Have you been eating black henbane? You don't know how to talk like a tsaritsa. The old woman flew into a fury. 'How dare you, peasant, answer me back? How dare you talk like that to a lady? My old woman is raging again. She doesn't want to be a fine lady. and his old woman is there in the hall. She is a tsaritsa sitting at table. while she nibbles on honeycakes. and all-but hacked him to pieces. 'Serves you right, you ignorant lout! Let this be a lesson to you, bumpkin! She sent her courtiers to fetch her husband. 'Go back, bow down to the fish. he was too frightened to open his mouth. Raging there was a black storm! angry waves were crashing and howling. 'Have mercy on me, Sovereign Fish! What am I to do with the wretched woman? she wants to be a sea empress. Not a word did the fish reply. and dived deep into the blue sea. But that was all the answer he got. He went back — to a hut made of mud. And before her lay a broken washtub. Translated into English by Robert Chandler. Why do you think the fish did what the fisherman asked? Was the fisherman's wife grateful? Can you explain why, or why not? Why did the fish swim away without speaking to the fisherman at the end? What happened next? What would you ask the fish for? Do you think he would grant your wish? Paint a picture of the cat and all the fantastic creatures in the first poem. 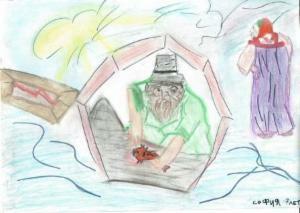 Paint a series of pictures to illustrate the story of the fisherman. You could do this on your own or share it with a group. Paint a picture of the fisherman when he first speaks to the fish. Paint a picture of the fisherman's wife at the end. Does she look angry, sad, happy or...? Retell the fisherman's story in your own words. Write a play about the fisherman and his wife and act it with your friends. 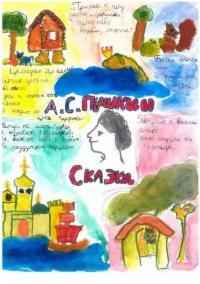 Can you find more fairytales by Pushkin on the internet or in the library? Which one is your favourite? Alexander Pushkin, The Queen of Spades and Selected Works. Poems and prose, translated by Anthony Briggs. Pushkin Press 2012. Which are your favourite poems and stories? If you read any of these books tell us which poems and stories by Pushkin you like best. Send a few words about why you like them with an extract or a picture to info@scotlandrussiaforum.org and we will share them here.